Pictured is a collection of the stylii that I have gradually acquired over the past year or two. My favorite is the Wacom, although it is also expensive, and the tip on my first one split within a few weeks of me using it - perhpas I was scrubbing too enthusiastically. The tips is quite soft. The iwand from stylus-r-us caught me with a large import tax to pay, but does have an interesting soft tip, and it extends. I find the ostylus lags too much to work - similar problem with the transparent ones, I don't like the hard feel of them. I do like the griffin, which is very similar to the Wacom only cheaper. I love the Alupen as well. Not pictured is my Kuel H10, which has a smaller but similar tip to the Wacom, and telescopes quite small. This is probably the one I use most, but only as I carry it with me all the time. 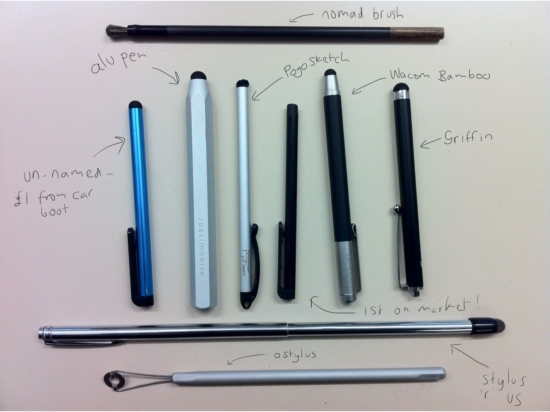 I very much look forward to a pressure sensitive stylus, and pogo is going to release one very soon (code name blue tiger).